Synchrono®, Inc. is leading the movement in demand-driven manufacturing with software that is enabling the factory of the future. Our portfolio of web-based applications focus on real-time synchronization of your enterprise and manufacturing operations – from supply chain and eKanban inventory replenishment to production and execution systems. Since 2001, we have helped clients worldwide bring Lean and constraints management principles to life; providing greater visibility, real-time information integration and increasing flow through plants and beyond to the extended supply chain ecosystem. Synchrono manufacturing software enables the real-time, synchronized, visual factory of the future – today. Our enterprise systems provide greater clarity, control and confidence providing our clients with a clear competitive advantage. 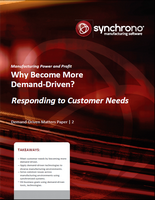 Synchrono empowers clients with demand-driven manufacturing processes to improve their competitive advantage, enabling continuous improvement, and exceeding customer expectations. 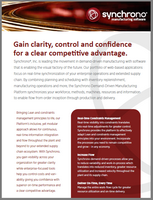 Get in sync with demand and learn more about Synchrono manufacturing software. Contact us today. Follow us and stay in sync. 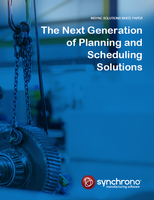 Synchrono was named a Cool Vendor in Manufacturing Operations by the Gartner Group. Find out why. 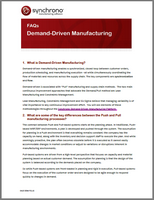 Why Become More Demand-Driven? Responding to Customer Needs.